Registration is available at the barn or via email. 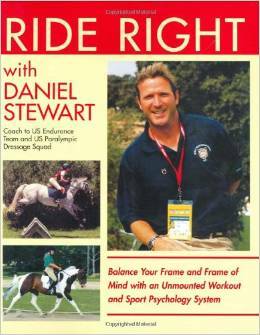 Daniel Stewart has been a successful international trainer and instructor for over 25 years. In addition to the US, he’s trained riders in Spain, Portugal, Canada, Mexico, Switzerland, Belgium, England, United Arab Emirates, Greece and West Indies. From 2000 to 2008 he coached riders on several US Equestrian Teams at World Championships, World Equestrian Games and Olympics. As the internationally acclaimed author of “Pressure Proof Your Riding” and “Ride Right” he’s widely considered one of the worlds leading experts on equestrian sport psychology, athletics and performance. He teaches clinics to thousands of riders each year and is a popular speaker at many national equestrian conventions. Coach Stewart lived in Andalusia Spain until recently but now resides in Naples FL where he teaches online instructor certification classes to riders who want to teach his many unique clinics. Coach Stewart’s amazing Pressure Proof Clinic series teaches riders how to improve their confidence, focus and success by learning how to overcome nerves, pressure, mistakes, expectations, poor memories and show-jitters. Learn a series of high energy rider-specific exercises that improve your stamina, balance, symmetry, core strength, suppleness, etc. using medicine and exercise balls, fit bands, balance pods, battle ropes, agility ladders and more! Learn how easy it can be to build confidence, focus, willpower and a positive attitude by learning a series of motivating tools to control the pressure, fears, doubts, show jitters and distractions often related to riding or showing. Mounted Price includes mounted and unmounted sessions plus one free auditor per rider. ← Talbot Run at the MD Horse Chase Kick Off – Come and Join US!